It is just about time for picnics and summer potlucks. And when you have a picnic or summer potluck, there is a calling for a pasta salad of some sort. 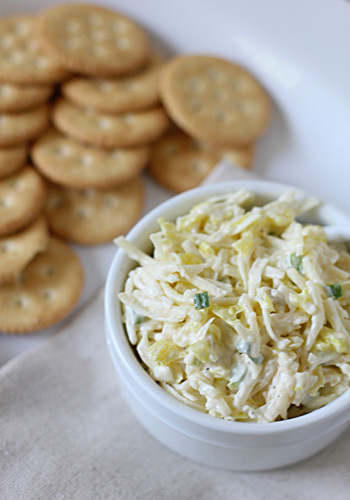 They are quick, relatively easy to prepare, and they feed a crowd. But the one thing I do not care for is a pasta salad that has been set up to the point where the pasta has absorbed all of the dressing. So I like to prepare/pack the pasta and the dressing separately, then toss it all together just before serving. This makes for a balanced pasta salad in taste and texture. 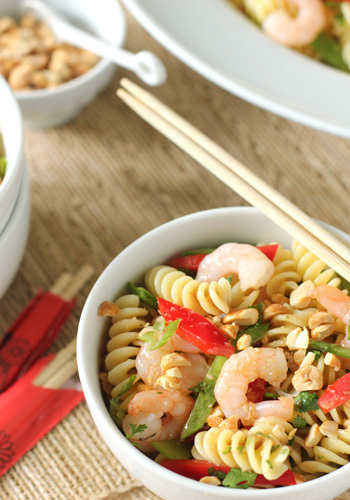 Shrimp, pasta (a fun shape is always a good thing for the kiddos), a few veggies, and a light ginger-soy dressing come together in this delicious Asian inspired pasta salad. 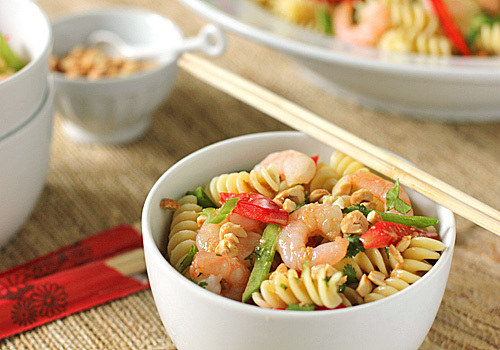 But what really makes this dish is the addition of the honey roasted peanuts. 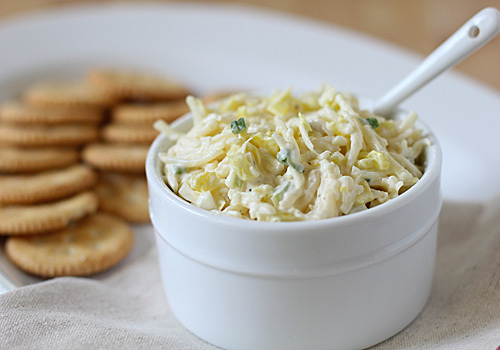 They add a wonderful sweet and savory crunch that we love. If you have allergy concerns about the peanuts, chow mien noodles or fried won-ton strips would be a good substitute, but don't add them until the very end. 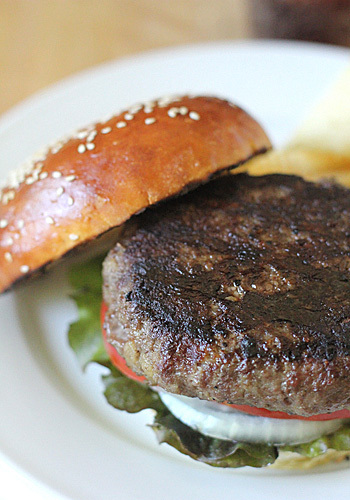 In case you weren't aware, May is National Burger Month. 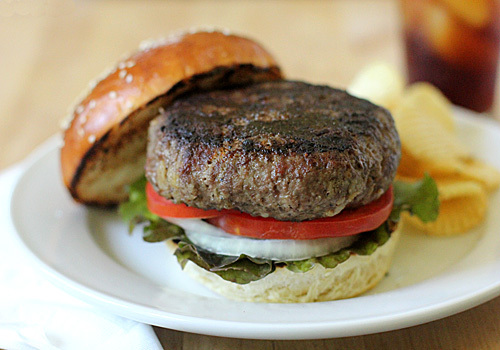 With a long weekend for grilling burgers with family and friends coming up, I certainly wanted to share one of our favorite burgers (o.k. one of many). But before I get to that recipe, I want you to have the recipe for a platform that can support that beefy goodness. 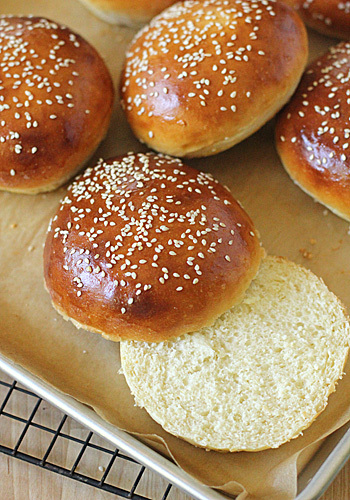 I know what you are thinking, make your own buns-- really?! But honestly, once you start (and taste) there really is no going back to the artificial cardboard flavor that comes from too many of the store-bought variety (not to mention the pocket change you save by doing so). I use my white bread dough recipe with a few minor adaptations. First, I enrich the dough with an egg. 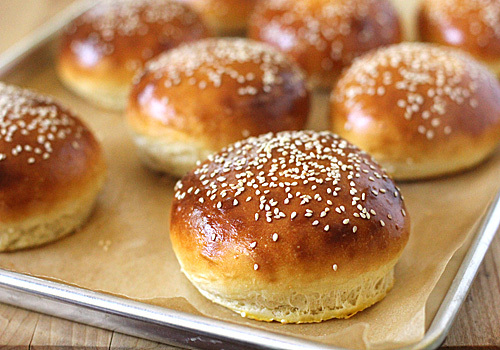 Once shaped, I brush the buns with an egg wash and give them a sprinkling of sesame seeds, poppy seeds, or leave them plain depending on the type of burger I am making. Finally, to give them a good rise in the oven I increase the baking temperature to 400° F.
The golden brown appearance, the slight pull, the buttery flavor--all these qualities help to make the at-home burger experience a truly exceptional one. It is the front end of strawberry season. 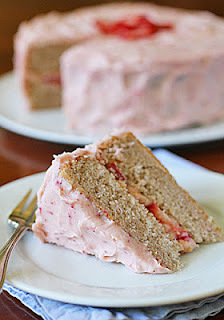 I have an itch to make a strawberry cake that needs scratchin'. 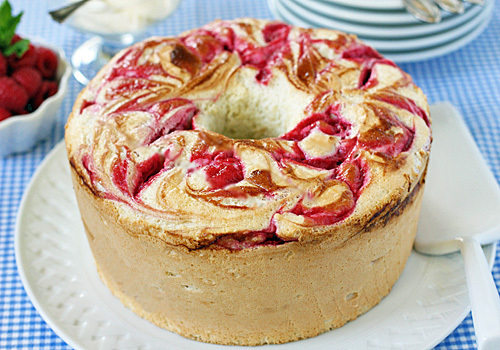 This cool little cake takes care of any and all cravings of the strawberry variety. 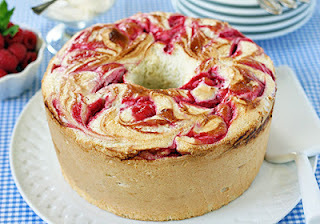 It is a white cake that has holes poked into the top after it has cooled-- hence the name. 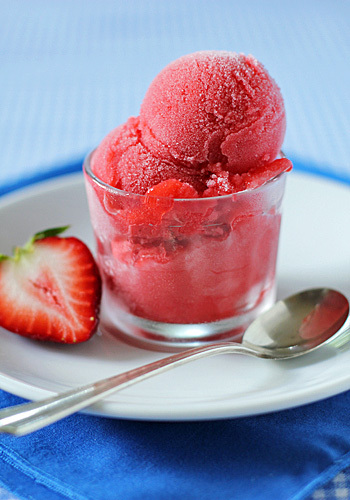 A strawberry gelatin syrup is then poured over the top. The holes act as tunnels for the syrup and all of its flavor to seep down and spread throughout the body of the cake. A layer of strawberry is spread over the top before a generous layer of whipped cream completes the construction. You'll note in the recipe that I call for a packet of whipping cream stabilizer. 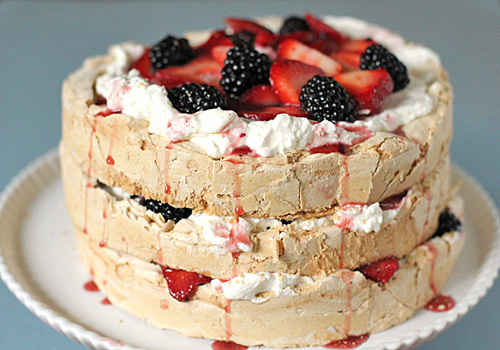 I do this so I can make the entire cake ahead of time without any weeping from the luscious cream layer. But if you plan on making the cake and eating it immediately without any leftovers, you can omit the stabilizer. 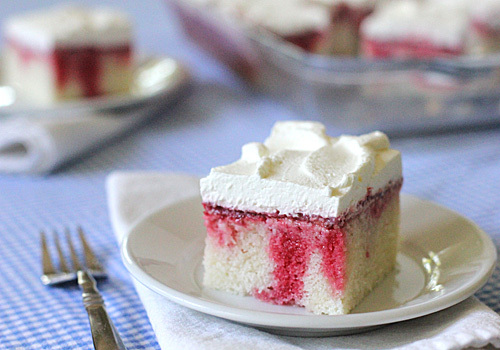 This is strawberry shortcake in sheet cake form and a great way to serve a delightful dessert for a crowd. 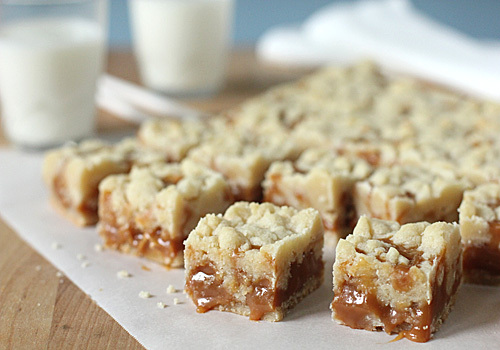 Say it with me... Gooey Caramel Butter Bars. The name says it all. But first, an apology to my Facebook followers for teasing you with this picture a couple of weeks ago. And a second apology to your diet because there is just no excuse for this one. However, I did lighten the recipe a little by using half and half instead of cream, but then I went and doubled the amount called for in the filling. Shame on me, but I promise you'll thank me. Caramel and shortbread... what's not to love?? The original recipe made a serving size of 15-30, but with an entire pound of butter and two bags of caramel candies, I cut them into smaller 1 1/2-inch bars for a reasonably sized guilty pleasure. The original recipe also called for dark rum in the mix, but I added a bit of Bailey's Caramel liqueur to boost the caramel flavor. The bars are still tasty without the liqueur if you don't want to use it. On the same note, I sometimes add peanuts, but they can be omitted. 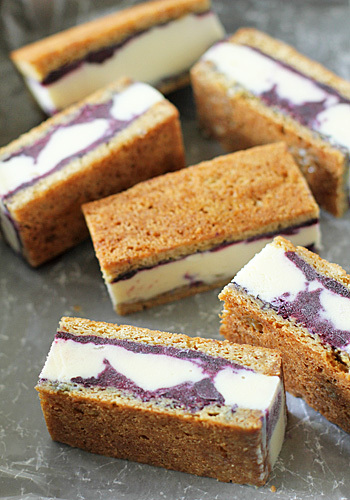 These bars make for an excellent dessert to take to a party. I opted to make a whole batch to keep in-house. I wrapped the bars individually in plastic wrap and stored them in the freezer, where they can be kept for up to one month. 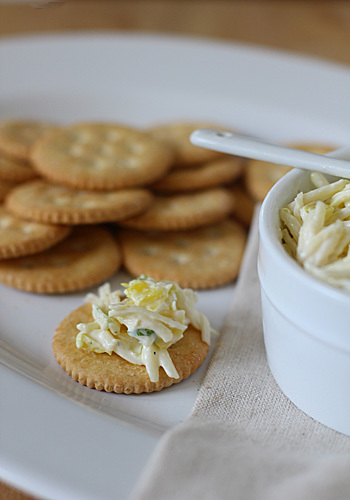 Doing so makes for a great last minute lunch box treat. I just pop them in the lunch box straight from the freezer and by the time lunch rolls around, my kids have a perfectly thawed piece of gooey caramel goodness. 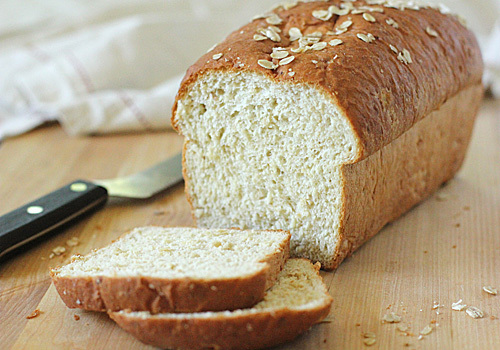 After reading the comments about what you would make first if you won the digital kitchen scale, I was delighted that many of you stated that you would make homemade bread. I thought I would take this opportunity to showcase this tasty sandwich bread. 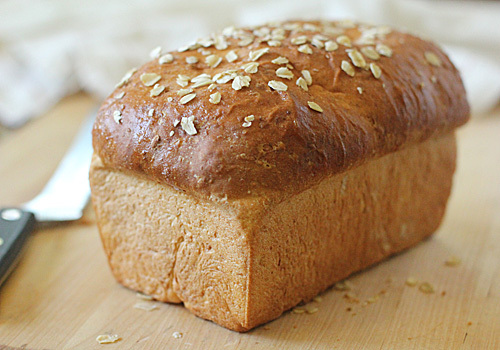 While I do use a scale when measuring, this bread can easily be made without one. 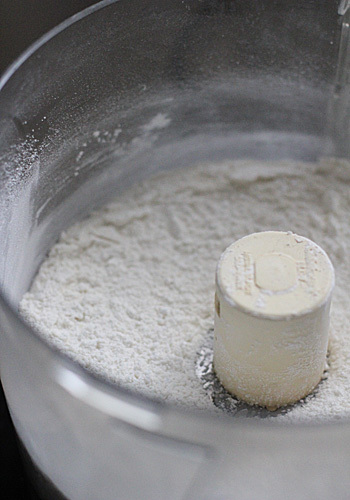 Just remember to use the spoon and level method when measuring your flour. Do not pack your flour or the bread will be too tough. I found this bread recipe years ago on the side of the King Arthur Unbleached Bread Flour bag. I made it, loved it, and took for granted that it would always be there. Big mistake. 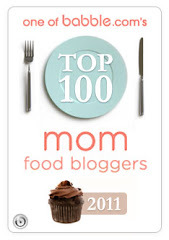 They stopped featuring that recipe and I was unable to find it anywhere in their books or website. Then many months ago, I was thrilled to see it back on the side of the bag. Ah, sweet serendipity! I quickly copied it down while a batch of dough was rising. The oatmeal provides a natural, homey taste and chewy texture. The bit of honey adds a perfectly paired sweetness. Once cooled and sliced, it makes for a wonderful deli sandwich and it toasts up beautifully as part of your morning meal. 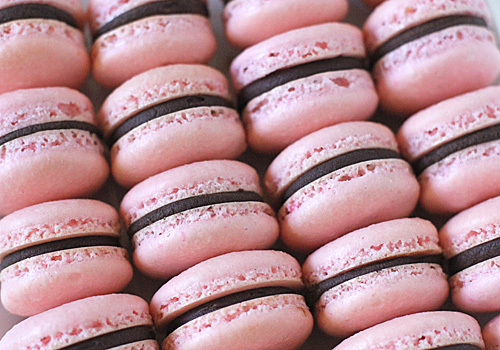 Ah...French Macarons (not to be confused with macaroons). I fell in love with these delicate pastries years ago when my husband and I vacationed in... not France, but Seattle of all places. There is a wonderful French bakery in Pike's Place Market called Le Panier. I was lured in by the aroma of fresh baked bread, but once I entered, I naturally made a bee line for the pastry case. There they were, all lined up like little soldiers. Since I couldn't decide on which flavor to indulge in, I chose one of each. What was the first bite like? Hmmm-- bliss, love, and all was good in the world. The outside was crunchy, the inside a gooey marshmallow heaven. It was from that moment that I was bitten by the macaron bug. Many people seem to get overwhelmed while making or even considering making these pastries. I can understand why. I have had a few trials and errors. They are a bit fussy, mainly due to measuring and humidity. And unless you are baking in a controlled environment, do not even attempt making these on a hot and humid day. 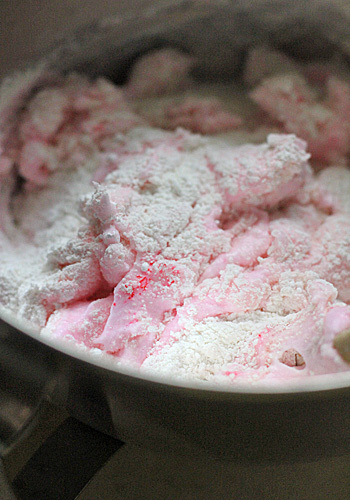 The batter is a meringue and meringues don't like moisture. 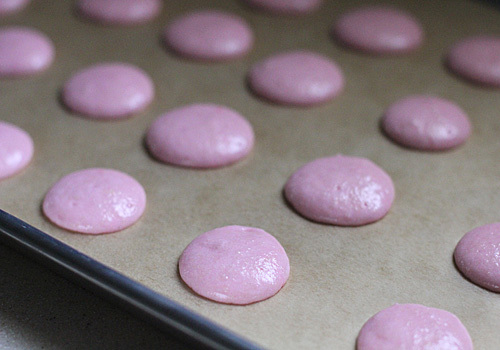 I think the most important information I can give you about making your own macarons is that it takes patience and practice. 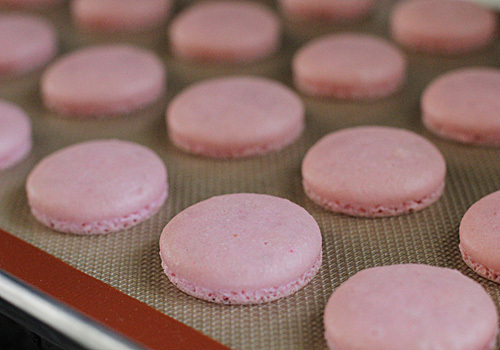 There seems to be hundreds of different recipes for macarons, but I have honed in on the one that works for me and my kitchen and I hope it works for you. I have included some step-by-steps to help you and I will discuss some pointers to help you along the way. I will start by saying that a kitchen scale is key. You need to weigh your ingredients. 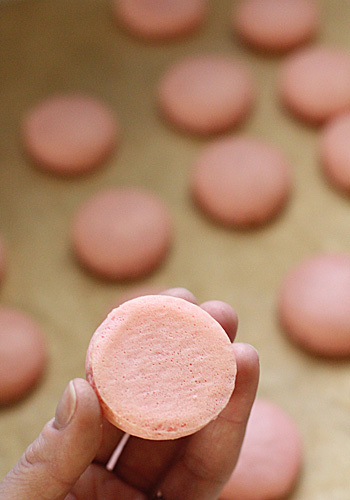 I use extra-large eggs (as I do in all my cooking) in my macarons and they usually weigh in at 99 grams, but as you can see in this picture, a chicken cut me short, but that little bit didn't make a difference in the end result. I also age the egg whites in the refrigerator to draw out a bit of moisture. 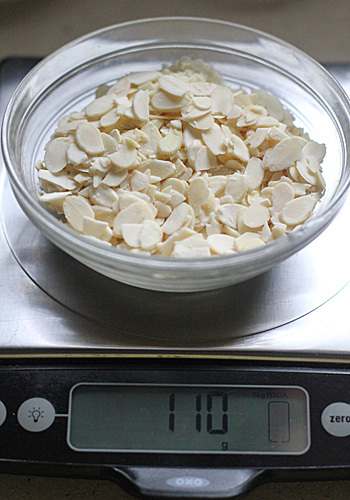 110 grams of almonds. They can be blanched, sliced, slivered, or ground. 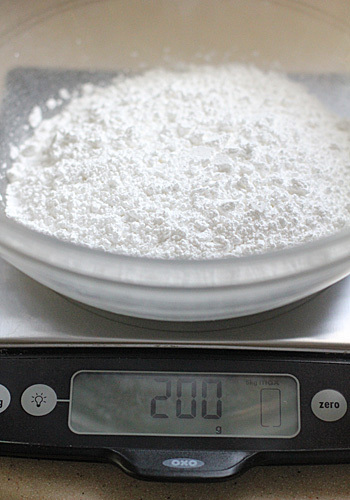 You also need 35 grams of granulated sugar, but I forgot to take a picture of that alone on the scale. ☺. 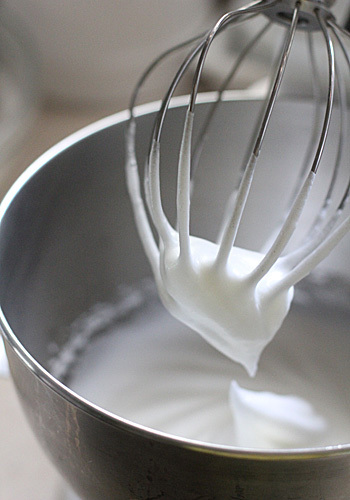 Using a stand mixer or a hand-held whisk, beat the egg whites on medium until foamy. 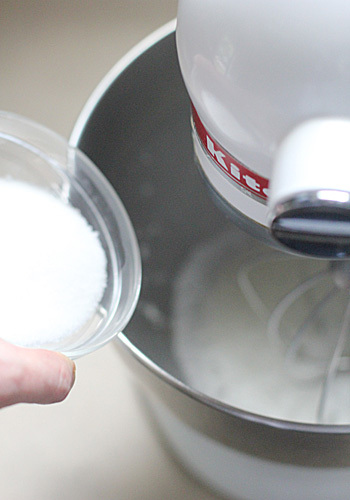 With the motor running, gradually add the granulated sugar a little at a time. Now comes the scary part. Add the ground almond mixture all at once to the egg whites. Using a rubber spatula, fold the almond mixture into the whites. At first, you will think-- "there is no way this is going to work", but keep on going. The mixture will become thick and sticky and the whites will deflate. This will take about 1 minute or about 50 strokes. You want the mixture to fall off the spatula in a molten mass, but not be runny like soup. 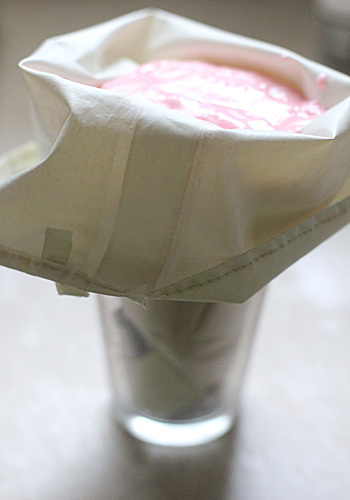 Fill a pastry bag fitted with a wide, round tip ( I use Ateco #808) with the meringue batter. 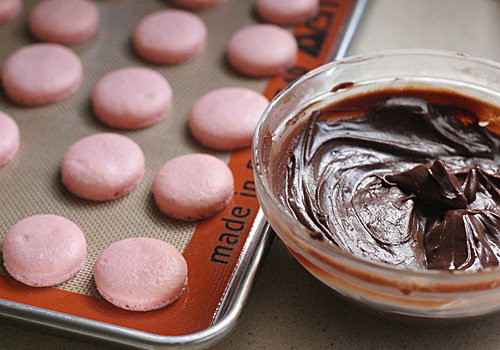 I place mine in a wide mouth jar or glass with the tip pointing up to keep the batter from oozing out. silcone coated parchment paper that is unbleached and chlorine free. Using regular parchment paper will warp the bottom of your cookies. Once piped, give the cookie sheet a good smack on the counter top to release any large air bubbles. 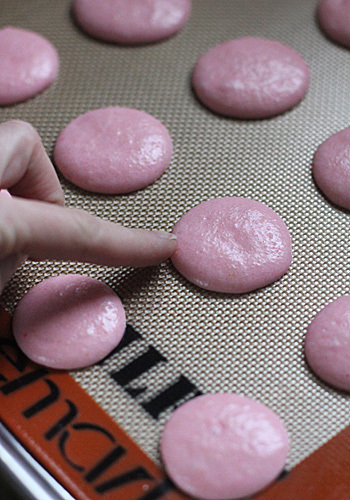 This next step is critical for the purpose of giving your macaron a smooth, shiny top and those signature feet on the bottom. 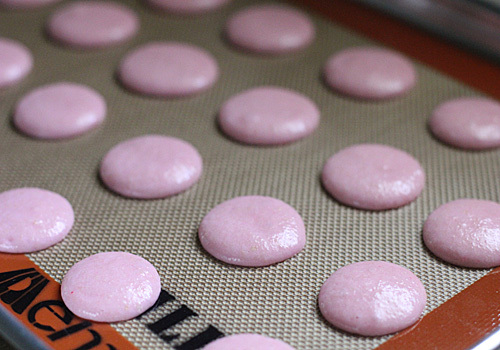 Let the macarons age for at least 30 minutes and up to an hour. They should not be sticky or tacky. with pretty little footsies! Now let the cookies cool completely on the baking sheets. Don't even try to pick one up. Go out, run an errand, or read a magazine from front to back, just don't touch the cookies! this is the bottom of one from the parchment. See? Still good. 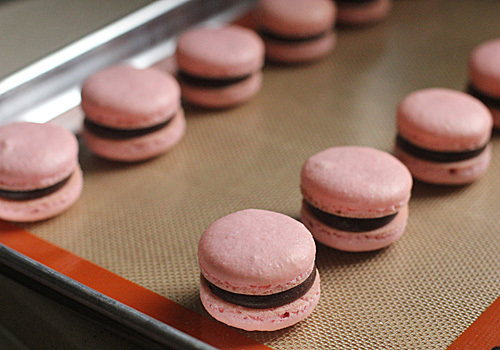 Macarons come in all flavors and are filled with an assortment of fillings. 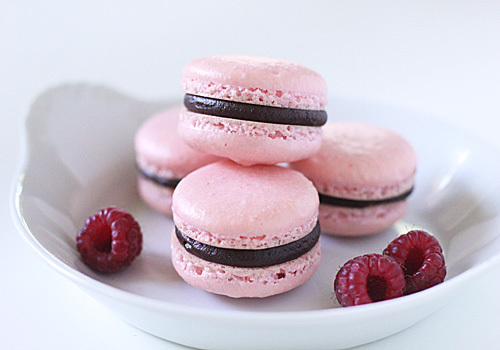 I am sharing a raspberry chocolate ganache today. 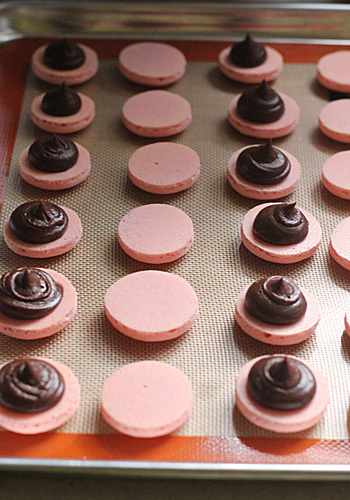 Flip the macarons over and match them up with a similarly sized partner. Spoon the filling onto the bottom of half the cookies or fill a pastry bag. 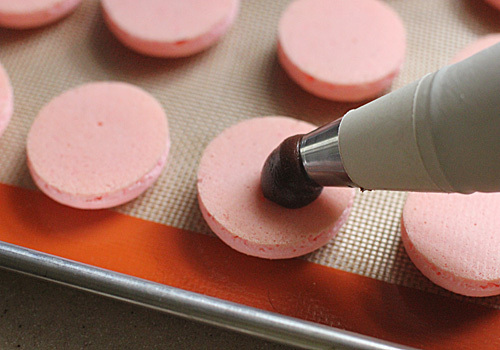 I fit my pastry bag with the Ateco #808 tip and pipe kisses of filling onto the bottom of half the macarons. Sandwich the halves together and give a very gentle press to even out the filling. The cookies can be eaten now, but personally, I think they are better once the filling has softened the bottom of the cookie halves. They can also be kept in an airtight container in the refrigerator for up to a week or even in the freezer (make-ahead!) for up to a month. Just let them come to room temperature before serving. Et Voilà! Go ahead and pat yourself on the back. You saved yourself a trip to France...or Seattle☺. Now here comes the fun part for me (and one of you). 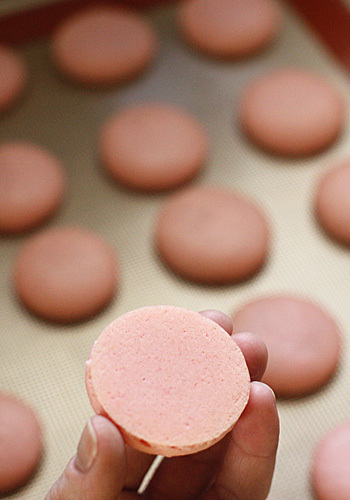 I couldn't post this recipe without giving away a vital component for macaron making to a lucky reader or follower. I am giving away an OXO Good Grips kitchen scale. This scale comes highly recommended by the testers at Cook's Illustrated. I could not agree more. I use it and I love it. It has an 11-pound capacity. 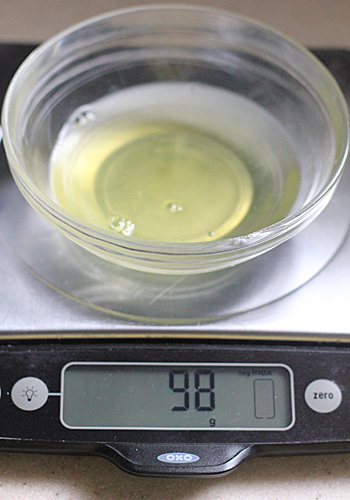 It features a zero-out function allowing you to measure multiple ingredients in the same bowl. It has an optional back light for those of you who bake in the dark☺, and it has a pull out display when you are measuring large, bulky items. So, for a chance to win this super-duper piece of kitchen equipment, here are the rules---- Leave a comment with your name (anonymous comments will not be considered as part of the giveaway) on this post telling me what you would make first with your new kitchen scale. If you already have one, go ahead and enter anyway, then share it with a friend or loved one who enjoys creating yumminess in their kitchen. For a second chance to win, like or follow The Galley Gourmet on Facebook then come back here and leave me another comment telling me that you do or did. A winner will be chosen at random using a random number generator. This giveaway, sponsored by me, begins on Friday, May 11 and will be open until Tuesday, May 15 (open to U.S. and Canadian residents only). The winner will be announced next Thursday, May 17 and asked to contact me via e-mail so I can send the lucky winner their prize. One last thing-- if you are a regular reader, you know that I share our Sunday dinner menus. Being that it is Mother's Day this Sunday, I am going to take the day off from blogging and be with my family, but we will still be having a delicious Sunday dinner☺. Raise your hand if you love Ina Garten. My hand is raised. She loves her husband deeply, she loves to entertain family and friends with simplicity and style, and her recipes are wonderful! 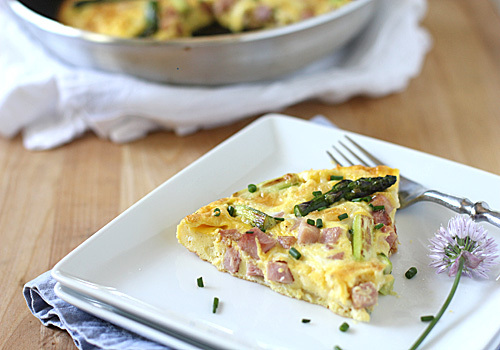 One of Ina's favorite meals to host is breakfast/brunch. 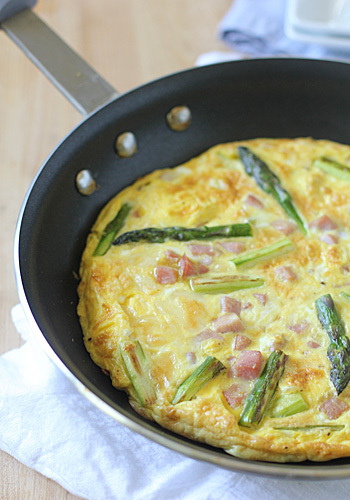 With Mother's Day brunch menus on many of your minds, I wanted to share a stress-free recipe for a gathering of people. Making pancakes and eggs for a family of five is something I enjoy on a regular basis, but who wants to get up in the morning and start being a short order cook for a crowd of people? Not Ina and certainly not me. 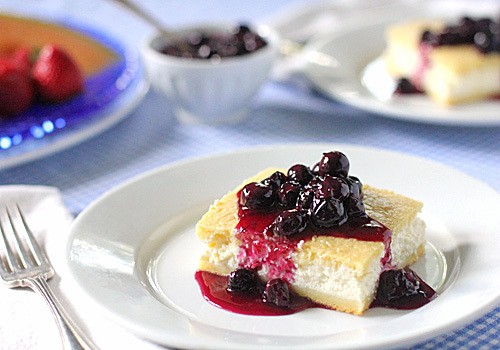 Here is a recipe of hers that includes all the flavors of a traditional cheese blintz without the fuss of making individual rolled blintzes. Wanting to stick with a more traditional cheese filling, I used cottage cheese and cream cheese in lieu of the ricotta and mascarpone. 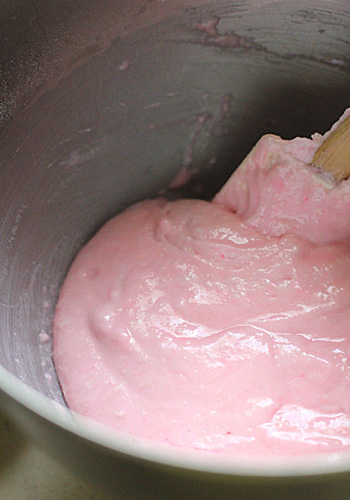 To make sure the filling is extra smooth and creamy, I run it through the food processor. This also cuts back on extra dirty bowls and spoons, making cleanup even faster *bonus*. You can certainly serve the baked blintz with any fruit topping of your choice, but I highly recommend the fresh blueberry sauce. I even make a little extra to serve over ice cream or yogurt. What to go to for a crunchy side when you are just kind of potatoed out? 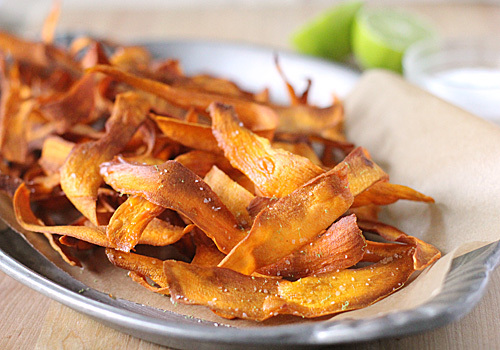 Thanks to my mother, I found the answer a while back with these delightfully delicious sweet potato chips or strips, as I like to call them. 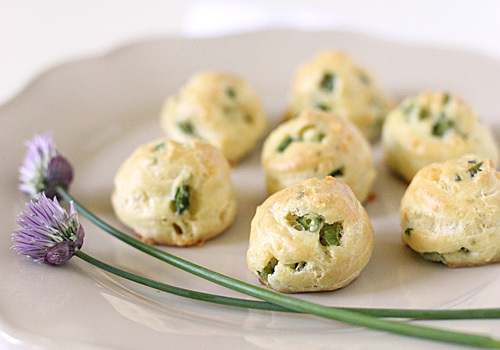 They are easy to make and can even be made ahead of time. Just store them in a plastic bag in a cool, dry place after they have cooled completely. And the utility of these sweet and salty wonders does not stop with side duty to a burger or sandwich. 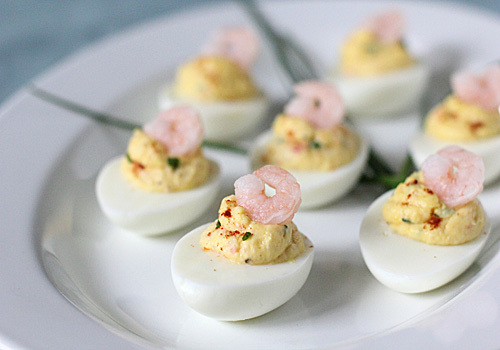 They make for a great appetizer and are fantastic in the role of bar food. We love the lime salt on them, but you can use plain salt or you can certainly come up with your own flavor combination to try. Normally I save the cocktails for the weekend, but sometimes you just have one of those days or, in this case, week. Three busy kids, school activities, home improvements, not to mention a 12-week old puppy that ate a year old rotten duck egg from the neighbor's yard (don't ask)! Yeah, that was fun to clean up. Let's just say a beverage to take the edge off was in order. I have to admit, I am not the biggest fan of hard alcohol. It is a bit too strong for me and goes down like fire water *cough*. But when it is shaken up with citrus, fruit flavors, and a bit of sugar, then I am on board. I made tacos the other night with leftover pork shoulder from Sunday (I'll get to that recipe soon) and homemade flour tortillas. So, I thought a fruity spin on the traditional margarita would be a great way to whet the appetite before dinner (and it was). 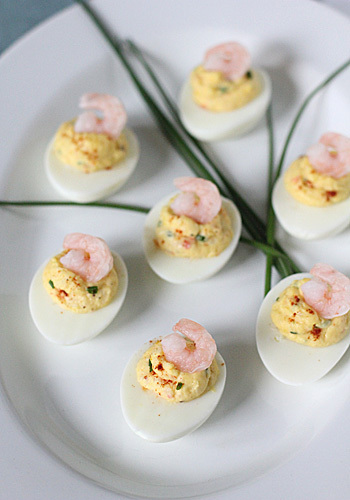 This is a great recipe to make for entertaining for two reasons. 1. 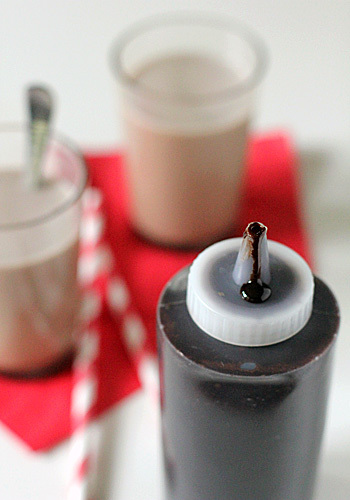 You can make a large batch of it and 2. You can make it ahead of time. Letting it set up allows the flavors to develop while a better blackberry taste comes through. 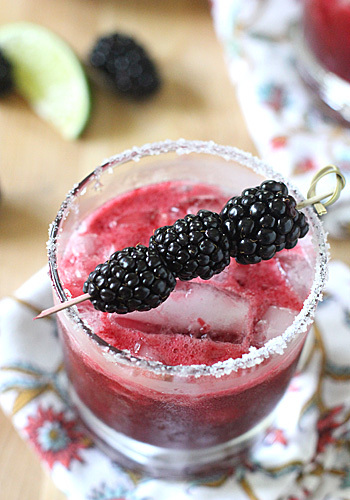 Since the blackberries are pureed, the mixture is a little thicker than a traditional margarita. But once poured over crushed ice, it has the perfect consistency. I like my cocktails on the sweeter side, but you can certainly dial back on the sugar to suit your own taste. 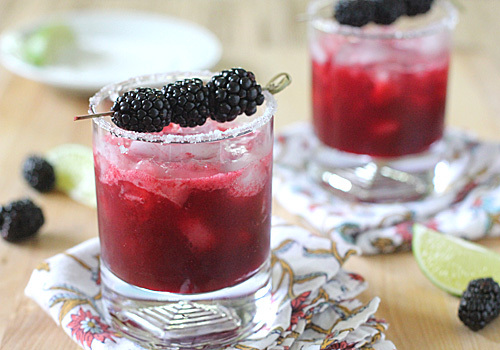 I also add a bit more lime juice because I love the blackberry-lime combination. Instead of the usual lime-salt rim, I use a mixture of sugar and salt to help it go down smooth. That sweet and salty kiss is the perfect prelude to a sip of this fruity cocktail. Boy, am I glad I have enough blackberries to make another batch. TGIF!